8 Lorong Ceylon, Kuala Lumpur. CHEF Massimo Zampar does not need a frying spatula when he cooks. Instead, he holds the pan in his left hand, stirring the contents by shaking the pan, or flipping them with a flick of his wrist. His only tool was a pair of tongs, which he used to nudge the bacon, garlic, mushrooms and cod when they stuck to the pan. The mixture sizzled, and a quick dash of brandy sent flames leaping up from the surface. After flavouring the mixture with pork and fish stock, chef Zampar tested the taste with a spoon. “Okay, it’s good,” he said. Boiled pappardelle (broad fettuccine) was added next, and an enticing plate of pasta was soon ready to be served. 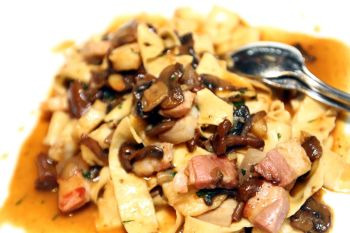 At Neroteca, a non-halal Italian restaurant under the Nero Group, pork dishes hog the limelight alongside fresh pasta. 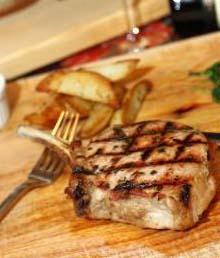 Tasty treats: The Grilled Pork Chop is served on a wooden board. Besides Porcellino (a roasted suckling pig weighing between two to three kilograms), Grilled Pork Chop is also one of the house specialties. The thick slab of pork — with sautéed spinach, roasted potato wedges and cream sauce on the side — was served on a wooden board. “The pork is seasoned with salt, pepper, rosemary and thyme before it is sent into the oven for about 20 minutes. “The cheese sauce is a mixture of gorgonzola, taleggio and parmesan cheeses,” Zampar revealed. Neroteca boasts a high ceiling that makes up for its narrow width, while the vintage interior and soft lighting provide a cosy ambience for patrons. Next to the open kitchen is a delicatessen, where assorted cheeses and salami were displayed. For our dinner, Chef Zampar picked a few varieties of the cured meat — mortadella, finocchiona, salami Milano, speck, Parma ham and honey ham — and paired these with burrata, a fresh, juicy and soft cheese. A plate of rustic bread and focaccia was served as well, to be dipped into the olive oil that was readily provided on every dining table. Pastaf avourite: The Pappardelle Special is flavoured with fish and pork stock and a pinch of salt. As far as desserts were concerned, the special tiramisu at Neroteca was not to be missed. Served in a cappuccino cup, it took on a local twist with additional layers of mango puree and cubed mango, besides the usual mascarpone and lady fingers. “I wanted to use a local fruit in this dessert. Mango is tasty and sweet, and people like it,” chef Zampar said. Another dessert he recommended was Millefoglie with Crema Pasticcera and Strawberry, a delightful combination of puff pastry, pastry cream and strawberries. 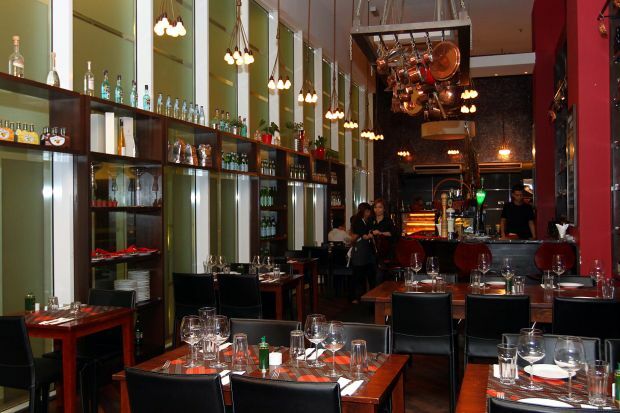 Neroteca also offers an extensive selection of Italian wines for the quintessential Italian dining experience,.